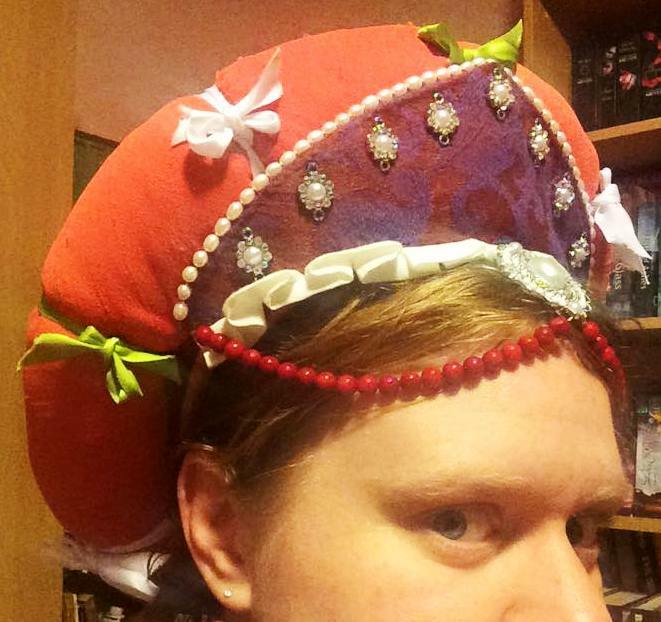 To wear with my recently completed “Mint Slice Dress“, which is modelled primarily on a late-15th to early-16th Century Italian (specifically, Brescia) style Court dress, I wanted to make some fancy headwear. 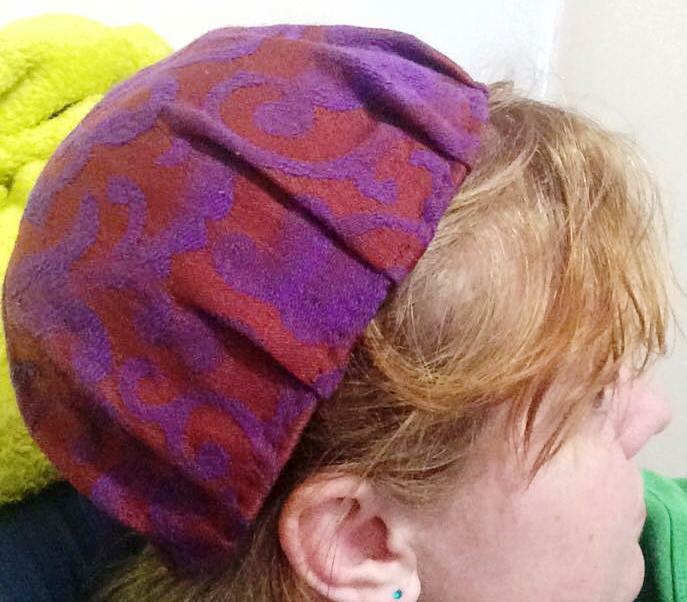 I came across a bizarre piece of headwear on the Lochac Lids Facebook group and was inspired to use it as the basis for my new hat. The inspirational portrait was ‘Portrait of a Lady’, attributed to Domenico Puligo (Florence 1492-1527) (Figure 1, right image). Figure 1: My finished balzo (left) beside the inspirational portrait (right). 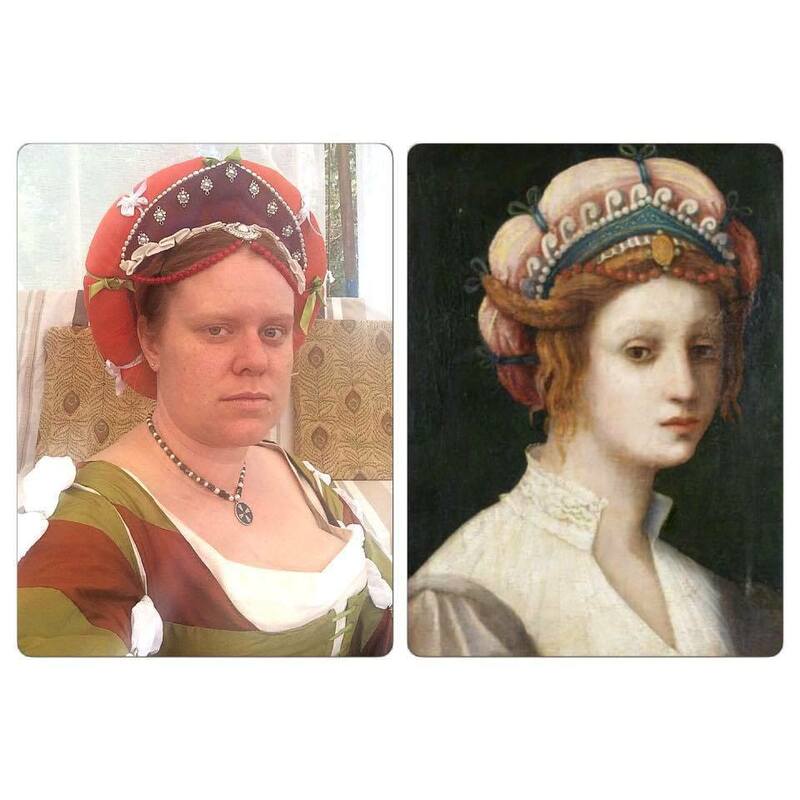 Left image by THL Ceara Shionnach, right image is ‘Portrait of a Lady’ attributed to Domenico Puligo (Florence 1492-1527). Despite appearing to be a bit allegorical (this being a style of painting where a biblical or mythological figure is painted wearing clothing and accessories similar to the time of the painting but with ‘made-up’ embellishments to make them look more ethereal), the basis of this piece of headwear appears to be the same structure as the later Italian balzo. 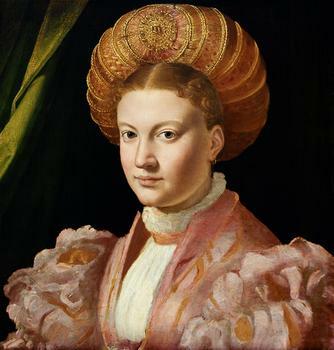 Balzos were prominent in the 15th and early 16th centuries throughout various parts of Italy, however, the headwear style did change with time. Earlier balzos were large, bulbous hats with a frame of possibly willow, wire or leather that was covered with hair, rich textiles, metallic ornaments, ribbons and/or braids (Anéa, 2001-2016). However, in the 16th century, a smaller type of balzo came into fashion that was fundamentally a cap with a padded roll around it. Images and descriptions of these later styles of balzo (see images published at Anéa, 2001-2016, and Figures 2-6) match the fundamental base structure and/or decorations of the headwear depicted in Figure 1 (right image). Figure 2: Portrait of a Young Lady, 1530, Francesco Mazzola (aka Parmigianino) (1503-1540). Figure 3: Two early 16th century balzo examples as observed in ‘The Concert’ by Callisto Piazza Da Lodi, 1528-30. The balzo in the centre has ribbons tied around the outside roll, which is a similar decoration observed in Figure 1 (right image). 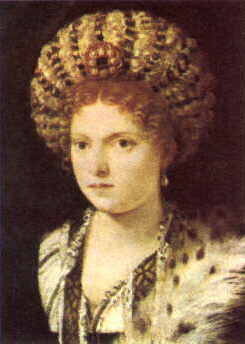 Figure 4: Portrait of Isabella d’Este by Tiziano, 1534. Figure 6: A Woman, probably Margherita Paleologo, ca. 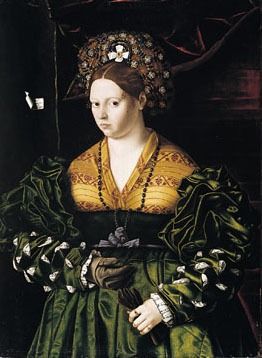 1531, by Giulio Romano (1499-1546). I used the knowledge I had gained by making my 16th Century Irish Onion Hat, which is of a similar structure to Figure 1 (right image), to come up with a structure plan for making a balzo like this. I started by making the cap of the balzo. I used an existing felt hat as the structural base of the hat. I pleated a circle of purple and maroon brocade fabric for the outside, being a ‘rich textile’ and matching the other colours I was planning on using (orange, green and white). Figure 7: I trimmed the brim from the felt hat (right) used it as the base of the crown for my balzo. Photo by THL Ceara Shionnah, 2015. 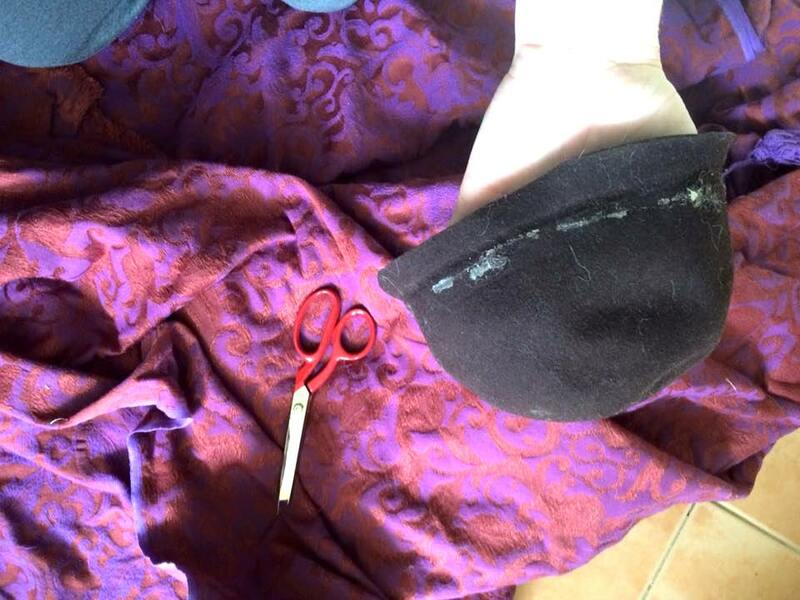 Once the brocade was sewn onto the felt crown, I pleated in a smaller circle of salmon-coloured linen for the lining. Figure 8: The outside of the crown after the brocade was pleated in. Photo by THL Ceara Shionnach, 2015. 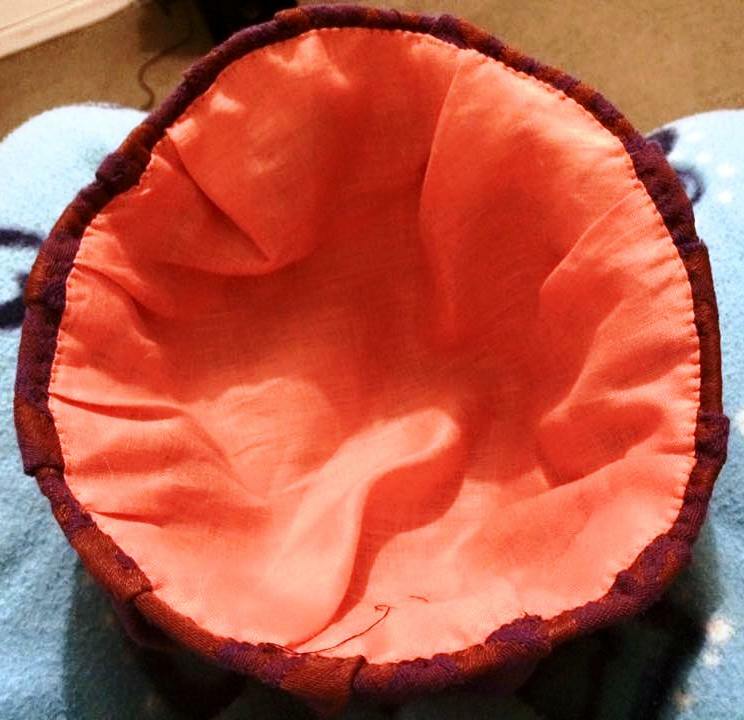 Figure 9: The lining of the crown is pleated in. Photo by THL Ceara Shionnach, 2015. 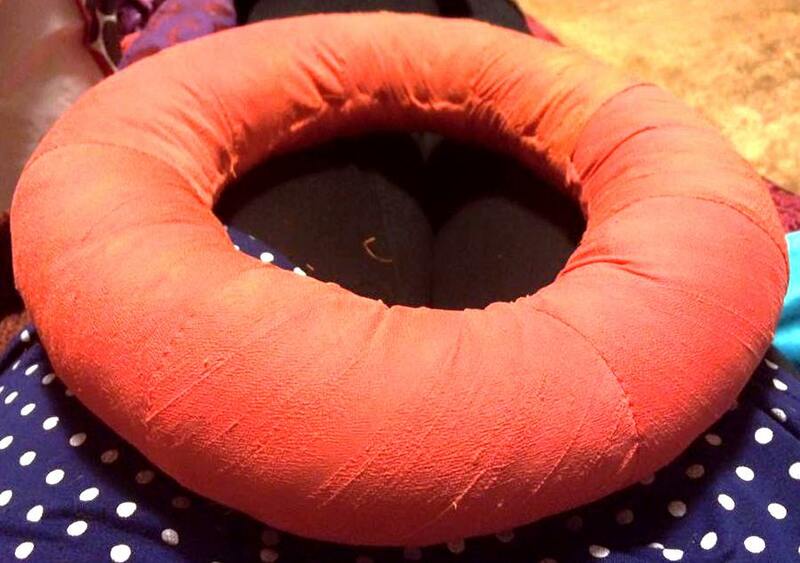 I was lucky in that I already had a pre-made padded roll lying around in my stash. It had a wire core with padding wound around it, covered in a black cotton or linen fabric, and happened to fit my head. I wrapped this roll in orange silk because the shade of orange would both match and clash with the brown and green of my Mint Slice Dress, and because it was a ‘rich textile’. I didn’t have much of the orange silk left, though, so I had to piece it together. I cut 6 strips along the bias (so it would stretch around the roll and sit more smoothly) and hand stitched them down. Figure 10: The padded roll (right) is being wrapped in orange silk. Photo by THL Ceara Shionnach, 2015. Figure 11: The finished roll after the seams were neatened. Photo by THL Ceara Shionnach, 2015. I tied alternating white and green ribbons at eight intersections along the padded roll, trying to emulate the spacing in the extant portrait inspiration (Figure 1, right image). I next stitched the padded roll onto the crown so that, as the crown sat on the back of the head, the padded roll would sit relatively vertical (to appear like a halo, similar to all of the extant images). 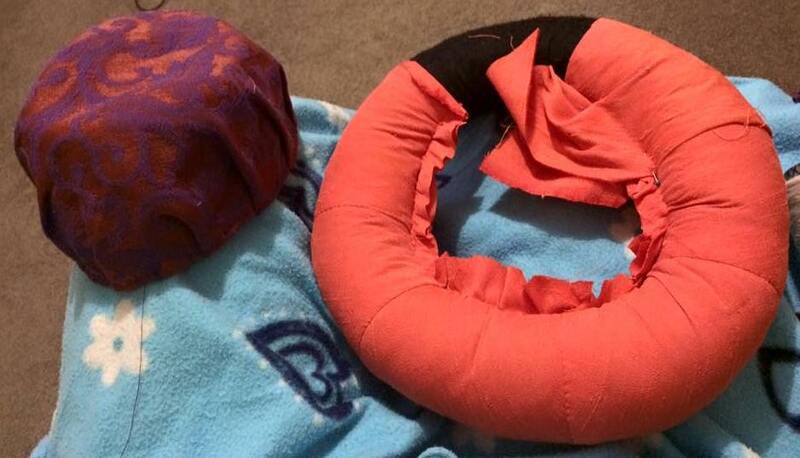 The ‘tiara like’ piece in front of the padded roll in Figure 1 (right image) I achieved by cutting a trapezoid out of buckram and couching wire around the edge for stability. I stitched more of the brocade used to cover the crown over the buckram form, and then the wire underneath allowed me to bend the buckram shape to curve with the head. I stitched a row of pearls along the top edges of the ‘tiara’, and broke up a metallic headband I found in Lovisa (a ‘trendy’, cheap, jewellery store) to use the metal flower motifs as decorations as well. In place of the starched, crimped veil/under-cap edge that was evident in the extant portrait in Figure 1 (right image), I decided to pleat a white linen edging under the front of the ‘tiara’. This allows the hat to be worn as one piece, the pleats will stay put without effort, and (to be honest) I wasn’t sure how a cap/veil would work under the balzo to look like the extant image (none of the rest of that particular element is visible in the portrait, or any of the other portraits I observed to date). 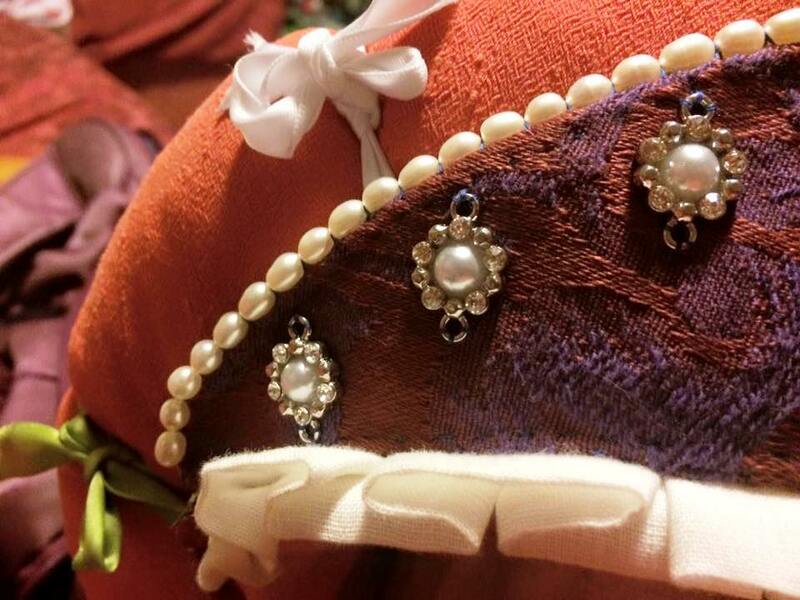 Figure 12: A close up of one edge of the buckram ‘tiara’ with the pearls, broken up jewellery flowers and pleating evident. Photo by THL Ceara Shionnach, 2015. Finally, I stitched a large metal motif that I obtained by breaking up a pair of earings (also from Lovisa) in the centre of the front, pleated edge of the buckram ‘tiara’. And, to that, I strung a wire of coral beads (just like those used in Figure 1, right image). I’m happy with the final product because it sits comfortably on my head (despite being heavy), and it turned out to be like what I imagined from the beginning.The buckram ‘tiara’ in my balzo is unintentionally a bit higher than that in Figure 1 (right image). I also had no idea what the white spiraly, sticky-uppy bits decorating the space between the ‘tiara’ and the padded roll of Figure 1 (right image) were so substituted with my own decoration of silver and white metal flowers. I couldn’t achieve the indents with the tying of the ribbons on my padded roll because the padding in my roll was a little stiff for that and trying to tie the ribbons tighter crinkled the fabric in an aesthetically displeasing way. Figure 13: The finished balzo. Photo by THL Ceara Shionnach, 2015. Anéa (2001-2016). Glossary in Words and Pictures, Balzo. Jones, Elizabeth (1992, 2001). 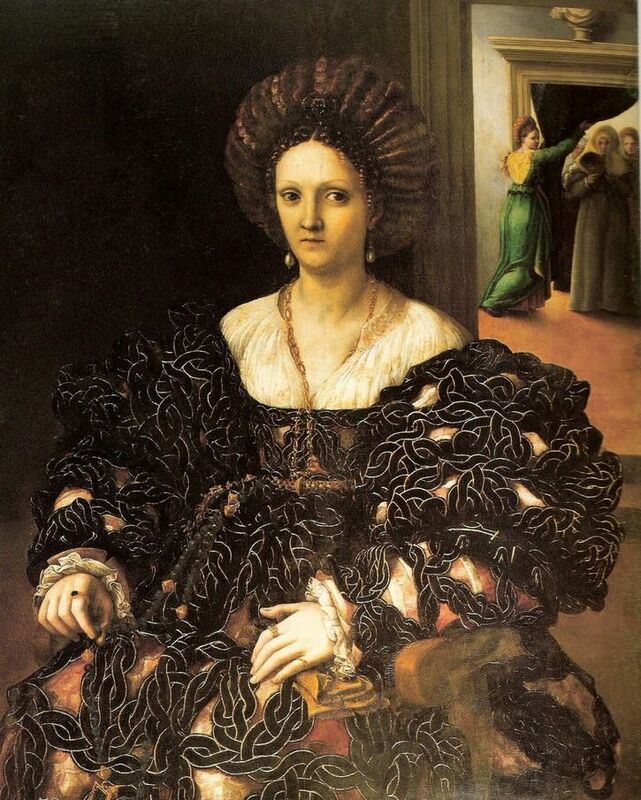 Portrait of Isabella d’Este by Tiziano, 1534 as published on The Wonderful, Bulbous Balzo (revisited). A Woman, probably Margherita Paleologo, ca. 1531, by Giulio Romano (1499-1546). Portrait of a Lady in a Green Dress, 1530, by Bartolomeo Veneto (1470-1531). Portrait of a Young Lady, 1530, Francesco Mazzola (aka Parmigianino) (1503-1540). Wikimedia Commons (last accessed June 2015). 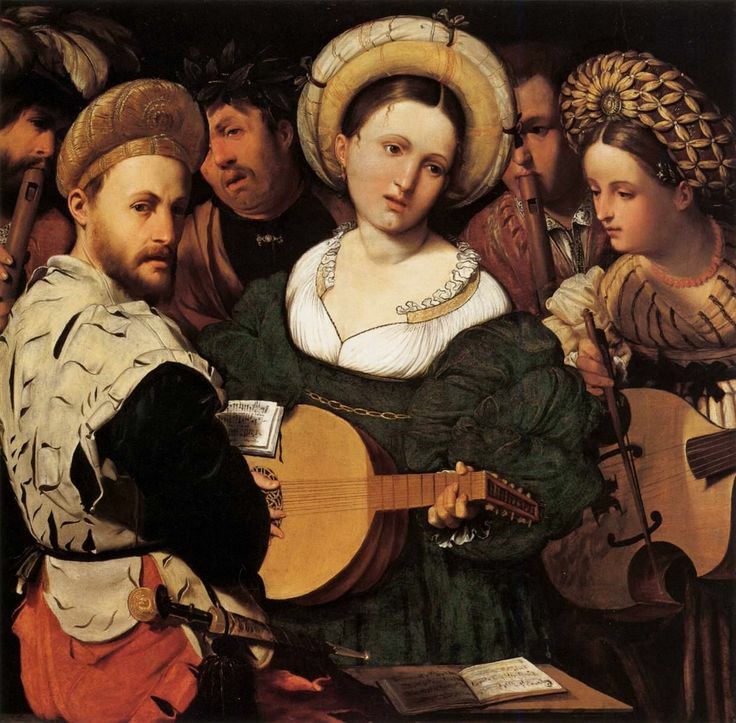 The Concert by Callisto Piazza Da Lodi, 1528-30.